Bloggers4UKIP: English Democrats slaying the UKIP dragon? 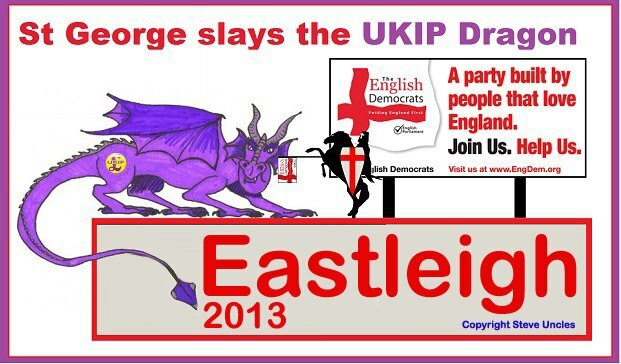 English Democrats slaying the UKIP dragon? The English Democrats got 70 votes in Eastleigh, finishing behind the Beer, Baccy and Crumpet Party, the Monster Raving Loony Party (again) and the Elvis Loves Pets Party. Any English patriots who are fed up of wasting their time with this useless lot should follow the example set by so many of their former colleagues and contact their local UKIP branch. There is only one way an English Parliament is going to get on the agenda in Westminster and that's through UKIP MPs. Membership is not available to anyone who is or has previously been a member of the British National Party, National Front, British Freedom Party, British People's Party, English Defence League, Britain First or the UK First Party. Any applications made from people who are or have been members of these organisations will be refused, and any subscriptions collected will be refunded.